Having two goals disallowed would frustrate a lot of soccer teams, but the Pahrump Valley girls soccer team isn’t one of them. 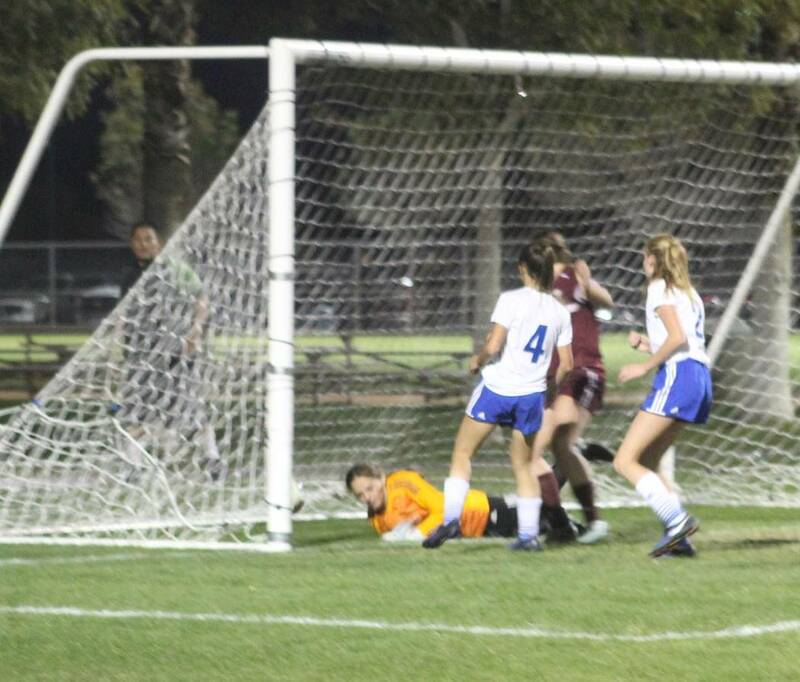 Tom Rysinski/Pahrump Valley Times Halie Souza sends the ball past a diving Moapa Valley goalkeeper Kyra Larsen for the only goal of Pahrump Valley's 1-0 victory Wednesday night in the Class 3A Southern Region Tournament in Las Vegas. 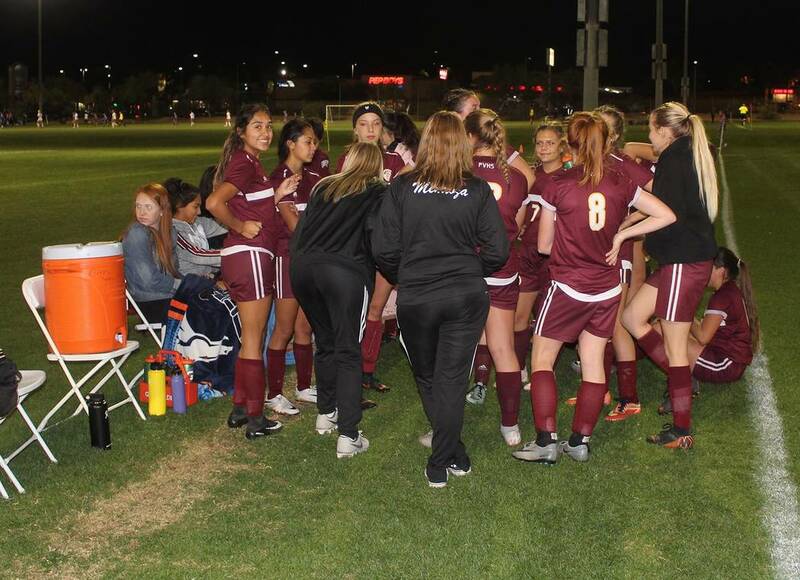 Tom Rysinski/Pahrump Valley Times Pahrump Valley High School girls soccer coach Julie Carrinton addresses her team at halftime of the Trojans' 1-0 win over Moapa Valley on Wednesday night at the Bettye Wilson Soccer Complex in Las Vegas. Tom Rysinski/Pahrump Valley Times Pahrump Valley senior Grace Gundacker battles a Moapa Valley defender for possession during the first half of Wednesday night's regional tournament game in Las Vegas. The Trojans defeated the Pirates 1-0. 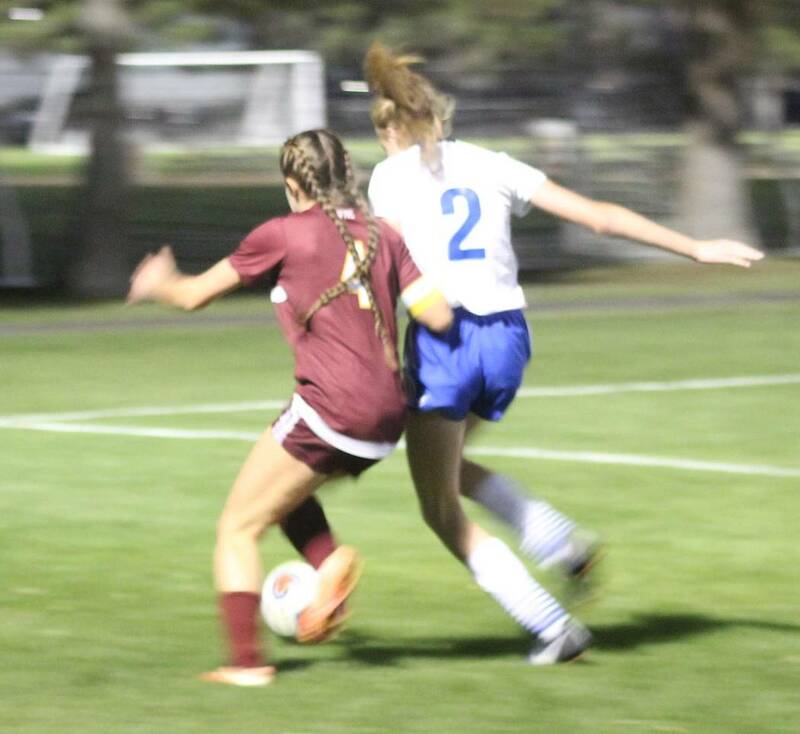 Halie Souza scored the game’s only goal and Hannah McElheny posted 14 saves to lead the Trojans to a 1-0 victory over Moapa Valley in the Class 3A Southern Region Tournament on Wednesday night at the Bettye Wilson Soccer Complex in Las Vegas. It was all Trojans in the first half, as the Pirates were sloppy with giveaways and not as crisp with their passes. “I am really satisfied with the first half,” Pahrump Valley coach Julie Carrington said. “We totally dominated the entire field. Everybody was supporting each other that whole first half. The Trojans (14-4-1) appeared to take a 1-0 lead early in the game on a goal off of a scramble in front of Moapa Valley keeper Kyra Larsen. “They were saying it was because we were pushing in the back, but they were doing it, too,” said Carrington, who was visibly frustrated by the officiating throughout the game. Souza’s goal in the 25th minute stood up, though, and it proved to be the only goal Pahrump Valley would need. The Pirates (8-8-1) came out firing in the second half, and the opening minutes featured the best soccer they played during the game. But they couldn’t solve McElheny and misfired on a couple of other chances. “After we realized they came out with a lot more intensity, we really stepped up our game and got where we needed to get,” the junior goalkeeper said. The more experienced Pirates did have chances down the stretch, including one open net. Their last gasp came inside of two minutes, when a handball was called on the Trojans just outside the box. But junior Kaitlyn Hopkins’ direct kick was wide of the mark and hit harmlessly against the side of the net. The Trojans advanced to meet Sunrise Mountain in the regional semifinals Thursday night. The winner of that game will qualify for the Class 3A state tournament and play again at 2 p.m. Saturday for the regional title. Angel Arreola led Sunrise Mountain (17-1-1) with four goals and two assists, upping his season totals to 32 goals and 21 assists, as the Miners posted a 7-1 win over the Trojans on Tuesday in the quarterfinals of the Class 3A Southern Region Tournament at the Bettye Wilson Soccer Complex in Las Vegas. Jonzo Jimenez-Vasquez had a goal and two assists, Luis Luna had one goal and one assist and Estiben Olandez had one goal for Sunrise Mountain. Jose Chavez had the lone goal for Pahrump Valley (12-9-1). Kate Daffer provided 12 kills and five aces to lead the Trojans (17-11) to a 15-25, 25-12, 25-23, 28-26 win over Sky Pointe in the quarterfinals of the Class 3A Southern Region tournament. Nicky Velazquez had nine kills, and Jackie Stobbe added eight assists for the Trojans.